The next edition of New Formations includes an essay of mine that has been the result of rethinking some of the key concepts in Contract & Contagion in the tumult of an almost two-year long boycott and divestment campaign directed against migration detention. Those key concepts are risk and uncertainty, but also, of course, contracts and contagion. The New Formations edition is on ‘Control,’ and the essays therein take Deleuze’s “Postscripts on the Societies of Control” as their subject or point of departure. I’m excited about reading them all. Begun as that boycott and divestment campaign was launched, my own essay in that edition is “Archipelago of Risk: Uncertainty, Borders and Migration Detention Systems,” New Formations n.84, 2015. A brief extract and some remarks below. It is possibly one of the more technical essays I’ve written, in part because it was written in the midst of comprehending the empirical detail of a system (the IDN) with a theoretical and conceptual apparatus turned toward its transformation. The political (and analytical) point in that essay is that conventional progressive and Left approaches to the issue of migration detention have no descriptive or transformative value. I am unsure what they do accomplish, though I’m sure they must do something or else they would not continue. But they barely describe how these systems function, oftentimes are simply wrong and marked by such resistance to curiosity and experiment as to be obstacles to both critical thinking and, not least, change. This echoes Deleuze’s point in the “Postscript” about the study of systems of control, and the basis of his praise for Foucault’s work. My own view is that the methodologies of Foucault’s “carceral archipelago” have been significantly transformed — hence the title and content of the essay. As to the political tumult during which that essay was written, the impact of that boycott and divestment campaign has been unprecedented. In less than two years, it has precipitated the first successful artstrike and boycott over an arts festival sponsor that I’m aware of; it led to the divestment of a major pension fund on grounds of ‘social’ criteria; Transfield Services’ shareprice has been halved and for another year it will be unable to pay dividends; the company has been forced to change its trademark and logo because its founders withdrew their trademark contract; and its Chair is about to speak at the University of Western Australia about what happens to a company when risk involves the damage to and withdrawal of a company’s “social license” to operate. Moreover, the campaign has been so effective that more recently it has spawned an effort by more conservative groups to leverage it so as to negotiate a ‘nicer cages’ arrangement and, in so doing, avert further divestment and salvage the company. Still, one of the earliest slogans in the divestment and boycott campaign has been “Risk Manage This!” And it is a continuing testament to the intelligence and courage of many of the crew around xBorder, Beyond Borders and, not least, those inside Australia’s detention camps who continue to fight for freedom, that the various, grassroots boycott and divestment projects that these campaigns have generated have been so stunningly effective. The other concepts that I keep turning over, obviously, are contract and contagion — which I think remain integral to understanding the dynamics and mechanisms at the conjuncture between speculative value and the border. On that note, there is a brief mention in the “Archipelago of Risk” essay on the changing of Transfield Service’s trademark and logo. The final proofs were submitted before there had been a decision on their new logo and company name. Which brings me to the pointy point of this post: News just in the last few days that Transfield Services, pending a decision at its next shareholders’ AGM at the end of October, is set to change its name to Broadspectrum. 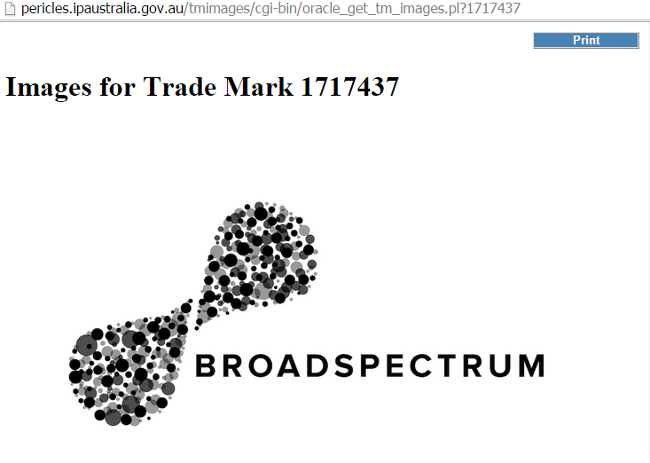 Broadspectrum. I could not have made this up. There was some discussion around which scifi dystopian imagining would emerge, but this one is surely on grim point. As far as has been ascertained in the trademarking registry, below is their prospective new logo, pending a decision at the shareholders’ AGM next month. Here is the new logo, pending decision, and furnishing a handy diagram of the weighing of bounded multiples. And more besides.